I’m ready for the change in lifestyle from business suits and heels to Hawaiian attire and flip flops. Come rain, come shine, Maui Wowi Hawaiian’s newest franchisee now has the flexibility to work where she wants, when she wants, and how often she wants. For Tina Lopez, this was a key component when deciding to begin her own business with Maui Wowi Hawaiian, an all-natural, fresh fruit smoothie and gourmet coffee franchise company. Since retiring, Lopez has decided to live a laidback lifestyle and serve quality products to Creswell, Oregon and the surrounding communities. Maui Wowi Hawaiian completed a successful transfer of agreement from an existing Franchisee to Lopez, which included one mobile event unit and one catering unit. The mobile event unit, called a Ka’anapli Cart, will allow Lopez to work an endless list of events and venues such as community youth athletic clubs, tournaments, festivals, and flea markets. Her additional catering unit will open up the doors to even more opportunity to work private functions like graduations, weddings, and corporate events. 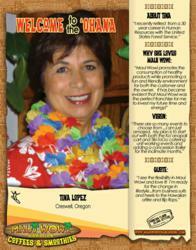 Within the next two years, Lopez aspires to be serving the ‘Aloha Spirit’ all across Oregon with her Ka’anapali Cart, catering unit, and the addition of a concession trailer that will give her more options to work indoors or out. “To me, the opportunities are endless,” she said. Maui Wowi Hawaiian specializes in serving premium products with island flair that include all-natural fresh fruit smoothies, gourmet Hawaiian coffees, and decadent espresso beverages. They can be found at events, venues, kiosks, and fixed retail locations, with franchise opportunities in the U.S. and internationally. Before the days of big Hawaiian resort hotels and fiberglass surfboards, surfers spent long, lazy days partaking in the tasty waves of the North Shore beaches. As the legends of the surfers grew, many were drawn to the healthy, carefree lifestyle of Hawaii. Since 1982, Maui Wowi Hawaiian has been spreading the ‘Aloha Spirit’ across the world with its premium Hawaiian coffees, all-natural fresh fruit smoothies and authentic Hawaiian products. From event carts, mall kiosks and stand-alone retail locations, Maui Wowi Hawaiian operates 605 units worldwide. For more information about Maui Wowi Hawaiian’s flexible, low cost franchising opportunities, visit http://www.mauiwowifranchise.com.